#6 This is very precious saree, as this belongs to my mother-in-law. 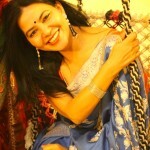 There is nostalgia attached to this saree. I have seen her wearing this many times. She was not keeping too well and rarely wore sarees. I would help her to drape them, whenever there was a social function. Its pure gold kota tissue which was given to me from her wardrobe after she passed away. 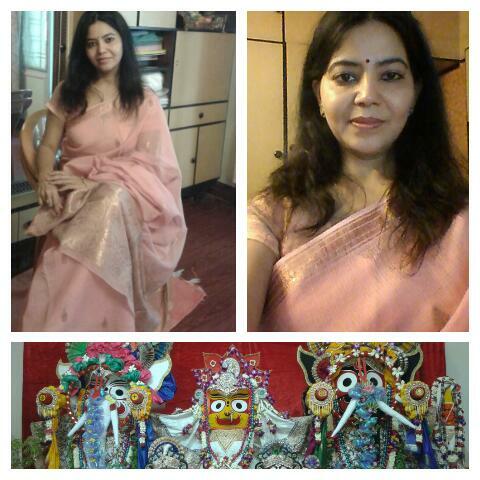 I wore it today for a early morning puja at Lord Jagannath Temple, Bhakti Vedanta before the commencement of Abhishek n Rathyatra in a day. Spicy Surprise loaded Saturday in a Six yard!